Space shuttle Atlantis will be returning to NASA's Kennedy Space Center in Florida for the very last time on Thursday morning, so there are just two days left to spot the winged spaceship soaring across the twilight morning sky. Unfortunately, the viewing circumstances do not favor any views for most of North America, with the exception of some of the southernmost states, as both Atlantis and the International Space Station will not be making favorable passes over the contiguous U.S. and Canada until after sunrise (during the daylight hours) through much of this week. If you live in favored locations in parts of Florida, the Bahamas, the Caribbean and Hawaii, you will get a chance to see both Atlantis and the International Space Station streak across the sky early on Tuesday morning. Moving on a northeast trajectory, Atlantis will appear very close to the much-brighter space station, having undocked from it just a few hours earlier. At about 6:05 a.m. EDT (1005 GMT) on Tuesday, the two space vehicles will be moving over western Panama. Continuing northeast over the Caribbean Sea, the station and shuttle will pass just east of Jamaica. For those lucky to be vacationing in Kingston, Atlantis will appear first, followed shortly after by the space station. They will appear over the south-southwest horizon at 5:05 a.m. local time and take about four minutes to move to the northeast. About minute after passing over Kingston, Atlantis and the station will sail over Windward Passage — a 50-mile (80-kilometer) strait between the easternmost region of Cuba and the northwest of Haiti. The spacecraft will move out over the Atlantic Ocean at around 6:09 a.m. Atlantic Standard Time and pass almost directly over Great Inagua, the third largest island in the Bahamas, as well as the much smaller island of Providenciales (or more commonly known as "Provo"). Attention Florida skywatchers: Look up! Those living in Florida will be relatively far-removed from the ground tracks of both space vehicles, and will need to concentrate their attention low toward the southeast part of the sky beginning around 6:07 a.m. EDT. Parts of South Florida will have an advantage over locations farther to the north and west because they will be closer to the tracks of Atlantis and the space station. From Key West and Miami, they will reach a maximum altitude of about 18 degrees and will take about minutes to skim across the sky from south-southeast to east-southeast. But from Orlando, they will get only 12 degrees up and be in the sky for only two minutes. And from Jacksonville, they’re only 10 degrees ("one fist") up from the southeast horizon and will be in view for less than a minute! In fact, those situated north and west of a line running from Jacksonville to Cross City — which includes the Florida Panhandle — are out of luck, since both Atlantis and the space station will likely be too low to be seen. If you are vacationing in San Juan, Puerto Rico, and the weather is good, you may have an opportunity to catch Atlantis and the station for two minutes beginning at 4:33 a.m. Atlantic Standard Time. You'll have to look very low in the southeast, as the two spacecraft will not get much higher than about 11 degrees above the horizon. A similar situation awaits those in Honolulu, Hawaii, except the time to start looking is 4:43 a.m., Hawaii Time. 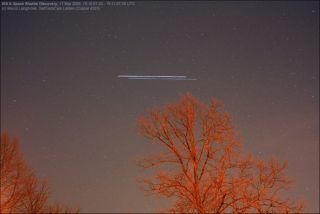 The shuttle will appear to lead the space across the sky by about 30 or 40 seconds. At around 5:45 a.m. Central Daylight Time, both spacecraft will be moving northeast over the Yucatan Peninsula of Mexico and then out over the Gulf of Mexico. Florida will already be in daylight, but farther west, those situated near and along the Gulf Coast should have visibility beginning at around 5:43 to 5:44 a.m. CDT with the two space craft emerging above the south-southeast horizon. New Orleans will see the two spacecraft for 3 minutes, reaching a maximum altitude of 22 degrees (more than "two fists") above the southeast horizon. From Brownsville and Houston, Texas, the maximum altitudes will only be about half as high (14 and 12 degrees respectively), but the duration each pass should last about three minutes. Farther east, Jackson, Mississippi will see both spacecraft reach a maximum altitude of 15 degrees, but they’ll only be visible for about a minute. Also, at 5:18 a.m. PDT, the two spacecraft will be passing directly over the southern tip of the Baja Peninsula. Well to the northwest, San Diego might get a two minute glimpse around this time, as Atlantis and the station skim about 11 degrees above the southeast horizon. And Hawaiians will have the best view of all, as both vehicles make a nearly direct southwest-to-northeast pass, lasting for four minutes beginning at 5:19 a.m. Hawaii Time. From Honolulu, Atlantis will climb to an altitude of 86 degrees, just four degrees shy of passing directly overhead! If you snap photo of the shuttle Atlantis flying free on its historic final mission and would like to share the image with SPACE.com for a possible story or image gallery, please contact Managing Editor Tariq Malik at: tmalik@space.com.